When we started our ranking in 2012, we initially included just 28 systems. With the latest additions for the February ranking, we have now extended that to 256 DBMSs. The most popular of the new systems is Datomic, a transactional, distributed database at rank 79. We also keep including very mature systems such as SQLBase at rank 89 and Oracle Rdb at rank 93. Sometimes, we are surprised that these systems, which many would call legacy systems, still have noticeable relevance today, and even appear in new job openings now and then. Other popular new systems are Apache Drill, Empress and Amazon Aurora, all of them positioned in the top half of our ranking. 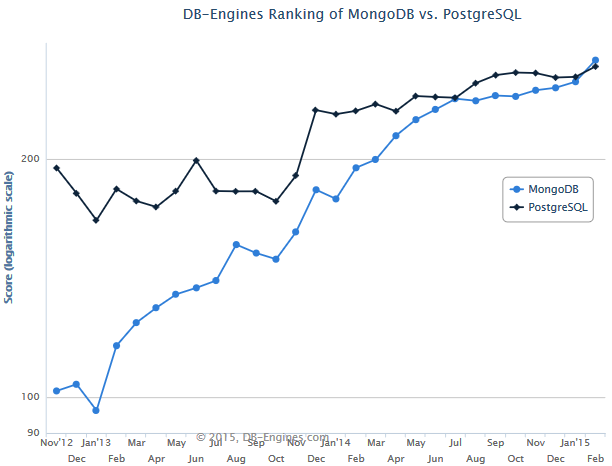 MongoDB now at rank 4. The most important change in the ranking is the rise of MongoDB to rank 4, changing positions with PostgreSQL, although PostgreSQL also significantly increased their score and actually reached their highest score ever. Two more NoSQL systems, Cassandra and Redis, are amongst the winners within the top 10, while Microsoft SQL Server lost more scoring points than any other system this month. That was a exciting start into 2015. Let's see what the rest of the year will bring.